As I've stated once or twice before, Everything But the House is quickly becoming my go-to online smorgasbord of fabulous finds. Most recently, I've been enamored by EBTH's fashion pieces. In their most current Atlanta sale, you will find several handbag gems just waiting to be snapped up and given a new chance at chic life. Can we talk about the beautiful mint bag below? And don't even get me started on the Prada bag that, as of the last time I checked, had a bid of only $35! That's PradA, not PradO, people (name that movie). At Everything but the House, all bidding starts at $1, plus the site has over 100 sales per month, so there's definitely something to be found for just about everyone. My favorite part is that there's no hassle with those irritating last minute snipers; all last minute bids add additional time to the bidding clock, so everyone has a fair shot. If you haven't had a chance to take a look at Everything but the House yet, be sure to do so soon. You won't regret it if you do, but I can guarantee you will if you don't! This post is sponsored by Everything but the House, but all opinions and fabulous fashion finds are my own. 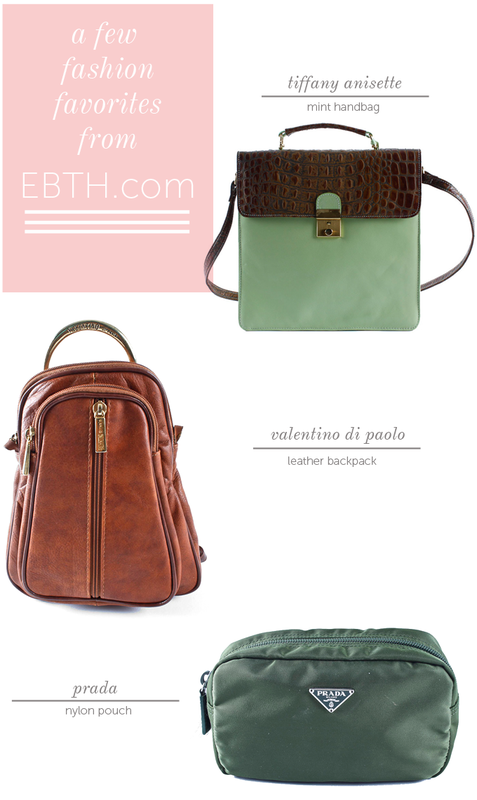 Love all these bags! And how awesome if you got it for $1? :) Thanks for introducing me to this Nicole!